The only thing tastier than a sip of apple cider on a cool, crisp fall day, is tasting it at a picturesque Midwest location like Kuipers Family Farm, and knowing the apples were handpicked straight from our Apple Orchard. Kuipers Family Farm is over 200 beautiful acres packed with succulent apples ready for the picking every fall. We take those apples and make the best apple cider you have ever tasted. Have some while you are walking the property and be sure to stock up to take enough home. Call 815-827-5200 for complete information about the Apple Orchard at the Kuiper Family Farm, where you can pick your own apples and apple cider, get your fill of pumpkins, and enjoy the calm, cool, crisp life on a Midwest farm. Apple-picking season is on weekends between August 19 and October 31st. 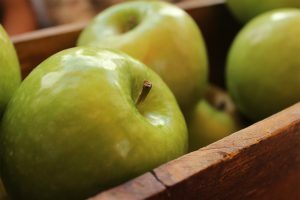 You can pick from a wide variety of the tastiest apples in the world. These apples range from sweet eating apples to varieties perfect for baking and for making our signature freshly-pressed apple cider. Stock up on Kuipers Family Farm’s famous apple cider doughnuts, home-baked pies, cream and butter fudge, and much more at the Orchard Bakery, and watch as real farmhands hand-spin caramel apples just for you and your group. Call 815-827-5200 for complete information about the Apple Orchard at the Kuipers Family Farm, where you can pick your own apples and apple cider, get your fill of pumpkins, and enjoy the calm, cool, crisp life on a Midwest farm.